Over the past 18 months some of my favourite bloggers have stopped writing. A number have taken a permanent hiatus, while others only tend to share their thoughts fleetingly. There are many reasons for this apparent decline and, seemingly, the trend is reflected within the corporate world – with just 1/3rd of Fortune 500 companies blogging. This is a huge opportunity being missed. I know from experience the benefits of corporate blogging and how blogs can supports a number of functions, such as marketing, public relations (PR) and branding – as well as many others. But don’t just take my word for it. There are lots of studies and publications which highlight the power of blogging. One of the most frequently cited studies is by HubSpot. The Massachusetts-based marketing maestros found that companies which blog, generate 55% more website visitors, 97% more inbound links and 434% more indexed pages – all of which will impact the bottom-line. There are numerous other studies which also spell out the benefits. With such compelling data, it begs the question why don’t more Fortune 500 companies blog? Every new blog post gives potential customers a reason to return to your website, deepen their relationship with your brand and become a customer. Blogs are the gift that keeps on giving, and if you’re skilled enough to create evergreen content, you’ll find that your blog generates high value traffic, time and time again. Many companies blog because it’s such an effective way to attract potential customers and the most best blogs have some form of call-to-action (CTA) which takes visitors to a landing page. Check out the HubSpot blog to see this in action – the blog entices you to read more content in exchange for your contact details, which are then scored and entered into their CRM. Blogs which regularly publish fresh, unique and quality content that is optimised for search e.g. target keyphrases, internal linking and on-page SEO will gain organic search traffic. To understand just how much your organic traffic is worth, compare it to the cost and performance of your paid for/PPC traffic. You may be surprised. Blogs give businesses the perfect platform to introduce new products to the world and answer any questions that potential or existing customers may have. The fact that blogs are owned media means businesses have full control over the content and can go into more detail than they otherwise would on earned media. Many successful organisations use blogs to host intellectual property and thought leading content. Altimeter Group, HubSpot and Edelman are just three examples of companies leveraging their blogs to become the authoritative, go-to source of information in their respective fields. While blogging won’t guarantee you a thought leadership position, it will raise your profile and open up your content to a larger audience. Simply put: great blog content gives you something to talk about on social media. You should create a content strategy that contains a mix of topics that resonate with your audience, but undoubtedly your blog content should feature in this. When executed successfully, social media can become a key driver of blog traffic and leads. Over the last decade the definition of public relations has expanded to include both owned and social media (as well as trusty earned media). Blogs give businesses an opportunity to tell their story, communicate their point of view and reply to comments. Blogs can also help businesses soften the tone and language they use, as well as explore topics in a more casual way. A shining example of a consumer brand using a blog to develop their voice is Innocent Smoothie. Blogging frequently and honestly can help businesses demonstrate that they listen to customer needs and feedback – all of which can build trust. Allowing blog readers the opportunity to have a discussion and comment will earn the respect and trust of your stakeholders. It shows that your business is open and trustworthy. One of the best examples of a company using a blog to increase transparency is Moz. Take a look at its ‘Year in Review’ and see what you think. Having watched the video, would you be more inclined to trust Moz to do the right thing? What’s interesting is that this level of radical transparency will become the ‘new normal’ among industry leading businesses – it’s no longer enough to focus solely on business goals. With everyone seemingly vying for that coveted thought leadership position, allowing your team to blog is a great way for employees to raise their profile and help your business become an authority. This is especially true in the B2B space with HubSpot, Marketo and Eloqua doing this particularly well. Also, it’s important that the author is clearly visible on blog posts – it should not be ‘admin’ or the company name. People want to know who wrote what, so they can build a relationship with the author, read more content or avoid them altogether. 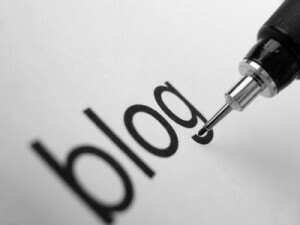 Does your business blog? I’d be interested to hear how it has benefitted.